Join us for a meeting of the Energy, Water & Environmental Sustainability Council. Councilwoman Nury Martinez joins our Energy, Water & Environmental Sustainability Council to kick off 2019. She represents Los Angeles' City Council District 6, which oversees the San Fernando Valley, North Hollywood and Van Nuys areas. Martinez also chairs the Energy, Climate Change and Environmental Justice Committee. The committee oversees policies relating to the Los Angeles Department of Water & Power (LADWP), Los Angeles Department of Sanitation (LASAN) and many other issue areas. She will discuss her priorities for 2019 and where the business community can partner on relevant issues. Additionally, the Council will host a panel with the public and private sector to discuss Measure W's implementation. LASAN's Chief Operating Officer Traci Minamide will be joined by Gil Crozes of Carollo Engineers, Judith Ibarra-Bianchetta of Tetra Tech and a representative from L.A. County to discuss the various aspects of Measure W's pending implementation. 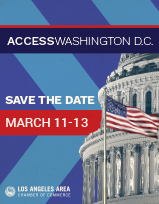 We will also finalize the 2019 policy agenda and discuss advocacy for our ACCESS Washington, D.C. trip in March. Additionally, we'll review relevant Sacramento legislation. The Energy, Water & Environmental Sustainability Council focuses on actions to spur clean and green tech innovations, ensure cost-effective water and power delivery, and promote economic growth through sustainable, pro-jobs energy and environmental policies. All Council meetings are open to Chamber members only. Media and guests are only allowed with prior approval. For more information, contact Kendal Asuncion, 213.580.7518.